TADASHI ENDO developed his very special dance-style, which appears like a walk on the tightrope between eastern and western culture and between the arts Theatre, Performance and Dance. He calls it Butoh-MA. MA in Zen-Buddhism means emptyness as well as spaces betweens the things. Tadashi Endo visualizes these spaces in their very fine changes. The moments, when one figure changes to the next or one image changes to the next, with nearly invisible movements and a very strong tension, are more important to him than the representation of the figure or the image. This tension, which he radiates with utmost concentration and perfect posture, transforms his dance to a representation of still movement. His body rests, although he dances. He is not dancing - he is danced. Toshinori Kondo, Aki Takase, M. Sato, Kozutoki Umezu, Steve Lacey, Conrad Bauer, Peter Kowald, Günter Sommer, Ulrich Gumpert, G. Gebbia, Heinz-Erich Gödecke a.o. 1980 - 86 Director of the Theatre-Kooperative Nordheim" with productions: "Freßsack und die Berliner Stadtmusikanten", "Grün", "Krieg der Clowns" and "Hiaburi"
Saturday, June 1, the japanese Butoh-Dancer Tadashi Endo will be guest in the Westrand at Dilbeek. Tadashi Endo is director of the Butoh-Centre in Göttingen. His repertoire consists of Noh-Theatre, Kabuki and Butho as well as of traditional forms of western theatre. In this synthesis of worldwide traditions, Tadashi Endo crosses each borders. But: the basis theme of the Butoh-Dance like the raw loneliness, the black hole of existence and the withdrawn trance the starting points of his movements. In Dilbeek Tadashi Endo presents the belgian première of 'Testament', in which the butoh-dance-theatre is confronted with the music of Shostakovich and Messiaen in a brilliant way. 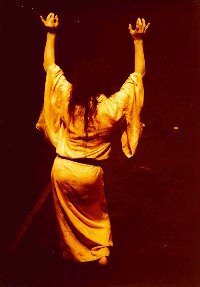 Ko Murobushi is one of the best known Butoh-dancers of our time. 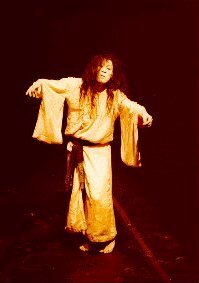 Born in Tokyo he was a little boy when Butoh was born in 1959 by Tatsumi Hijikata but in 1968 he already studied and performed with Hijikata in Japan. After this first contact with Butoh Ko retired from the stage in 1970 and practised for two years ascetic life and shamanism as so-called "Yamabushi" in the Japanese mountains. Back into society he founded the Butoh-Group DAIRAKUDAN together with Ushio Amagatsu, Akaji Maro and others, doing several performances in Tokyo and Kyoto. 1974 he created the Butoh-magazine "Hageshii Kisetsu (Violent Season)" and founded a female Butoh-Compagnie "ARIADONE" for which he did many choreographies. 2 years later he founded a similar only-male Butoh-group: SEBI. LE DERNIER EDEN - PORTE DE L'AU - DE LA succeeded in Paris in 1978 and was followed by a big tour through whole Europe with ARIADONE in 1981/82. From this time on Ko Murobushi settled down in Paris and made Paris to the European capital of Butoh. Lots of choreographies followed: for ARIADONE as well as for Carlotta Ikeda, Urara Kusanagi, Tadashi Endo and others. Beneath the work as choreographer for himself and others Ko keeps a strong tradition of improvisational performances which culminated in 1986 in a cooperation with the Glenn Branca Orchestra in Tokyo. Urara Kusanagi is different to all other japanese BUTOH dancers. She is not using artificial or dramatic butoh dance language. She is very natural, she is fragile, sometimes nearly transparent, trembling, delicate and ephemeral. She is absence and existence at the same moment. a portrait of <A HREF="http://thing.at/performance-index/personnier.htm" target="_top">Gérald Personnier</A>,a swiss performer, who performs with butoh dancers. An announcement of a performance of Min Tanaka: "Min Tanaka is the founder of the Body Weather dance workshop and the heir apparent of the Butch style, a method developed by Tatsumi Hijikata. Tanaka says, "Dance is an attempt to be reborn again and again. I believe that dance has no form. It is something that comes alive between me and you at the moment when I dance." Such sentiments have placed him in perfect company to join forces with the likes of improvisational guitarist Derek Bailey, composer Iannis Xenakis and pianist Cecil Taylor, as well as many more artists of all flavors." This page has been uploaded November 15, 1996 by Cornelie Müller-Gödecke and is a late-delivered birthday-present for Tadashi Endo. You can reach me at: cmg@avantart.com. Please have a look at my pages, where I introduce you to russian theatre, jazz and avantgarde music, the Beijing Jazzfestival and many other subjects or click through the table of content.